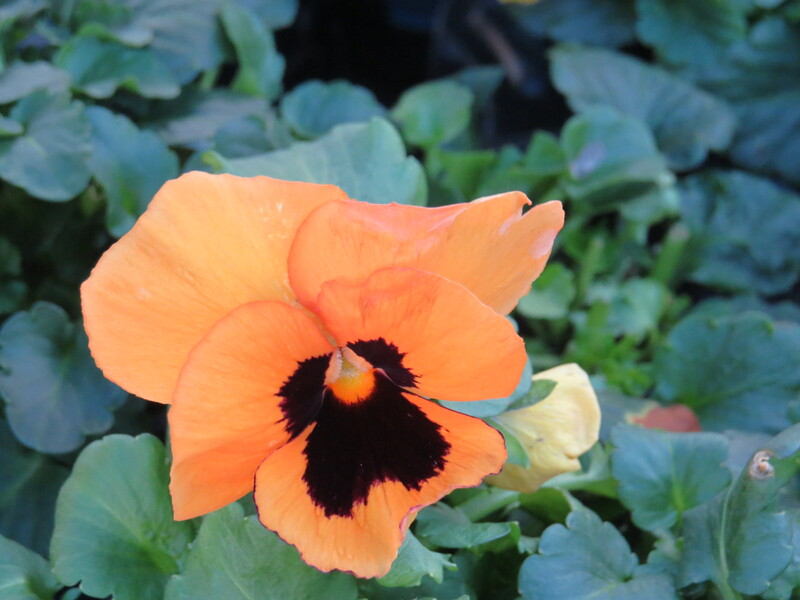 Dear Readers, pansies are one of the few bedding plants that can be found in bloom throughout the winter months, and in spite of all the many, many diseases and pests that they are heir to, they are many people’s first choice for colour in the cold weather. I am always impressed by the way that the plants continue to flower even when there is snow on the ground, although my personal taste leans towards the smaller, more delicate viola-type flowers. In fact, pansies are hybrids of the wild viola (Viola tricolor) , or heartsease, an elegant European wildflower. The distinction between ‘pansies’ and ‘violas’ is hence a tricky one. 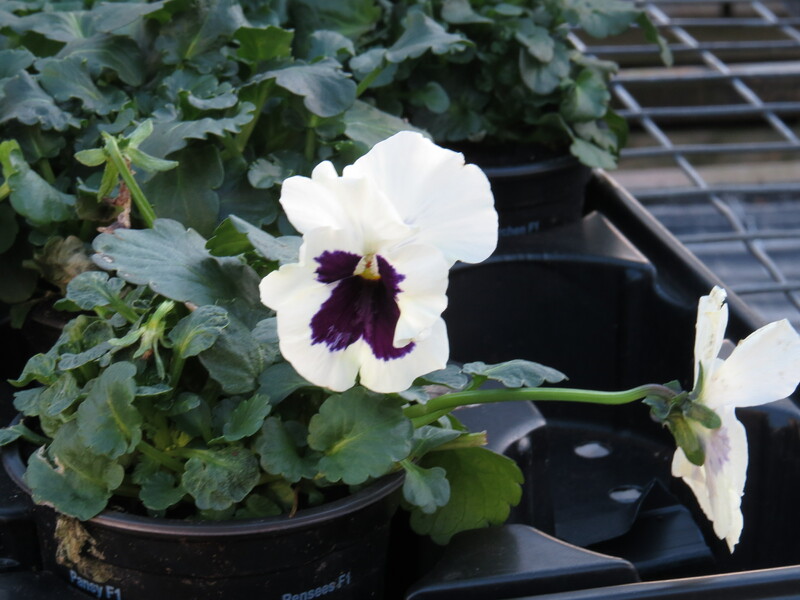 One American distinction is that ‘pansies’ are plants which have a clear and distinctive ‘blotch’ in the middle, but in general horticulturalists seem to call the larger plants ‘pansies’ and the smaller ones ‘violas’ or even ‘violettas’. 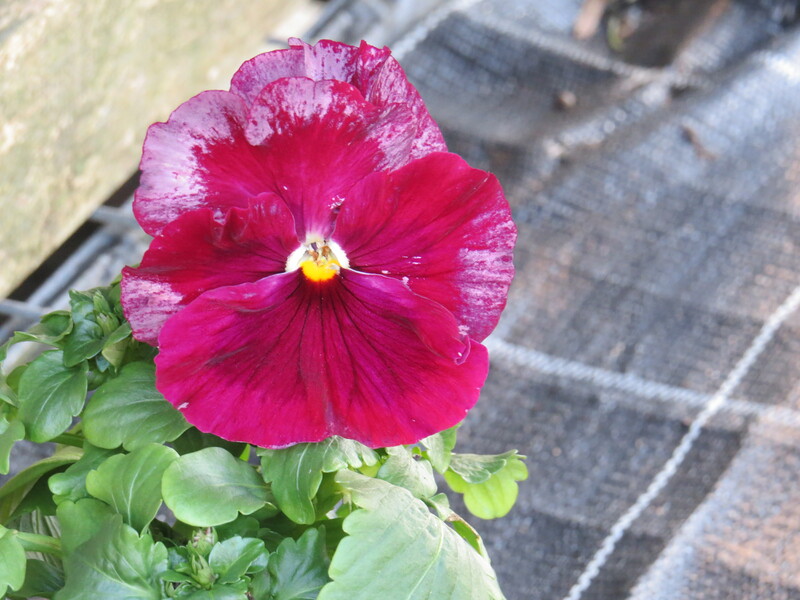 The name ‘pansy’ comes from the French pensée or ‘thoughts’, and the plant is also known as ‘love-in-idleness’ : Shakespeare includes the plant in Ophelia’s bouquet ‘ ‘There’s pansies, that’s for thoughts’. In German-speaking countries, the pansy’s name means ‘the stepmother’, and the flower is used to illustrate a folk tale, with the large bottom petal being the stepmother, the two petals to either side being the happy, well-dressed daughters, and the top two petals being the sad and bedraggled stepdaughters. We can imagine some kind of Cinderella tale being told, I suspect. 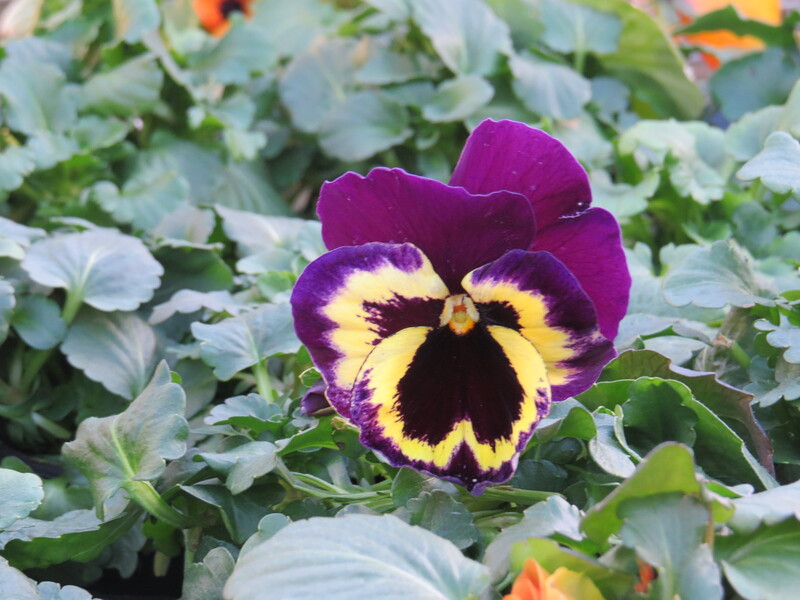 The development of pansy varieties kicked off in the early nineteenth century, and began in the gardens of Lady Mary Elizabeth Bennett, who combined every colour variant of heartsease that she could find. At the same time another aristocrat, James, Lord Gambier, was playing with hybrids of heartsease and other species of viola. It was during his endeavours that the classical ‘face’ of the pansy appeared, and it was introduced to the public in 1839 under the name ‘Medora’. It is those ‘faces’ which have given the pansy some of its more whimsical names: ‘Three faces in a hood’, and ‘Jump up and kiss me’. The trouble that I have with pansies is that they seem to attract every aphid in the garden. Furthermore, my plants have suffered with mildew (both downy and powdery, and sometimes one followed by the other) and the wretched survivors have then collapsed with stem rot. I sometimes wonder if I am cut out for this gardening lark. On the other hand I have some splendid camellias and my daphne is a sight to behold, so maybe all is not lost. 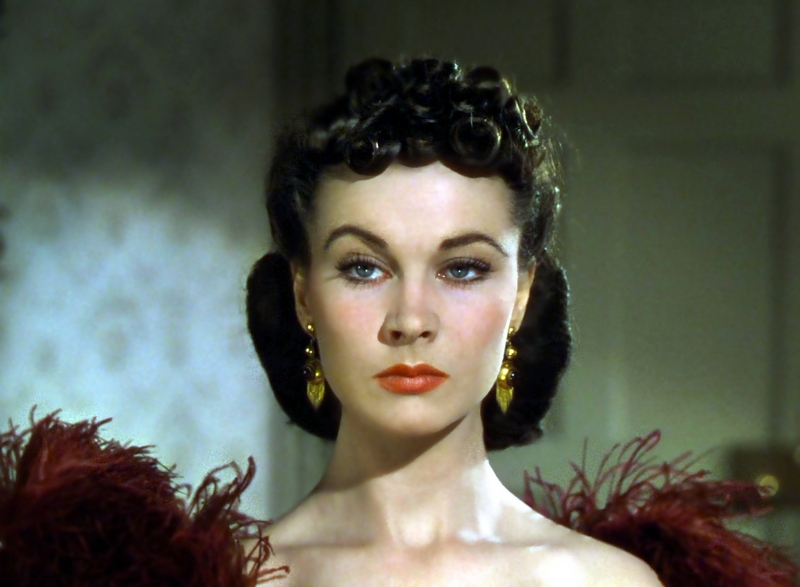 Apparently the heroine of Margaret Mitchell’s ‘Gone With the Wind’ was originally going to be called Pansy, but the name was changed to Scarlett at the last minute, and just as well I think. 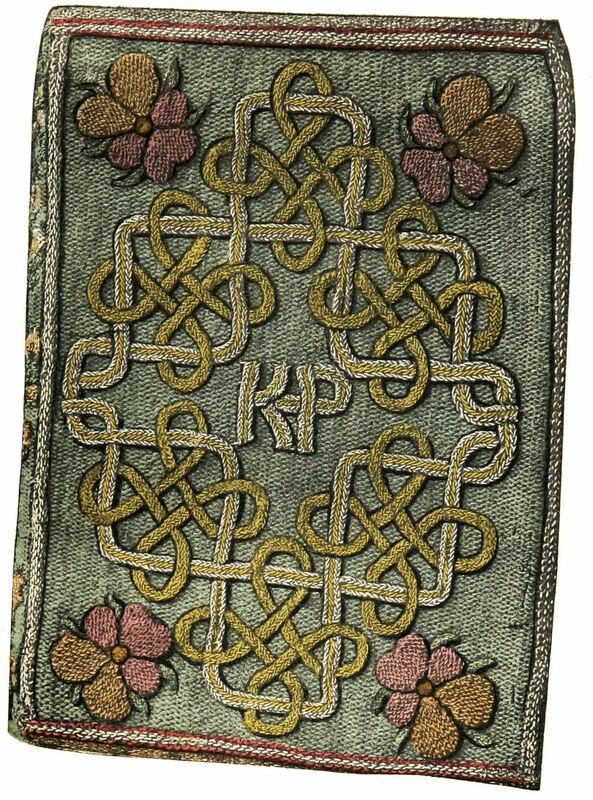 The pansy was thought to be symbolic of humility long before it was linked to love, and I cannot resist the urge to show you this bookbinding embroidered by no other than Elizabeth I for her stepmother Katherine Parr. There are pansies in each corner, and what a fine piece of work it is! This was made when Elizabeth was only eleven. The dedication reads ‘To our most noble and vertuous Quene Katherin, Elizabeth her humble daughter wisheth perpetuall felicitie and everlasting joye‘. I’m rather moved by this. There can’t be many young girls who have had their mother executed by their father, and there seems to be a world of hope for a more stable and loving world in those few words. Pansies have inspired many artists, including two of my favourite painters, Vincent van Gogh and Georgia O’Keefe. 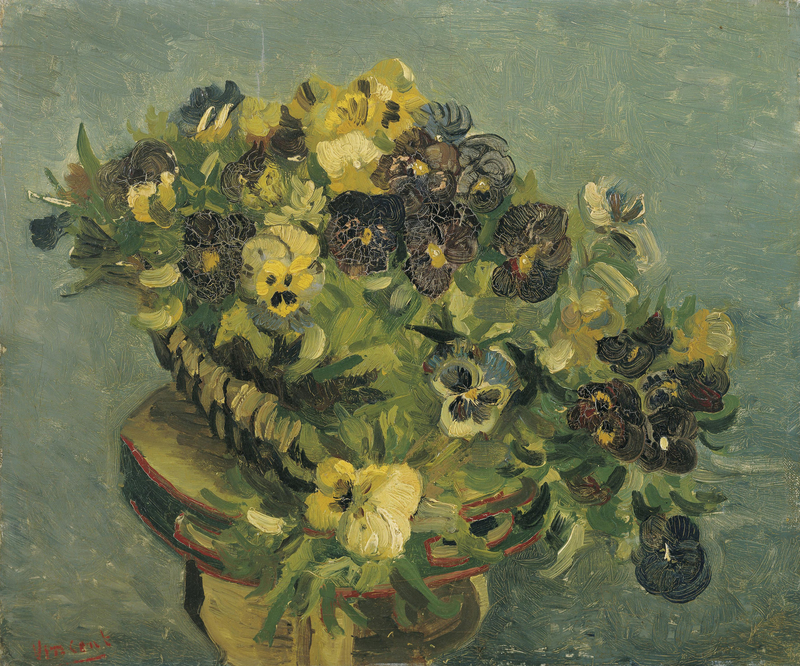 I find the van Gogh painting a little drabber than his usual flower paintings, but then it was created very late in his life (he died 3 years later). 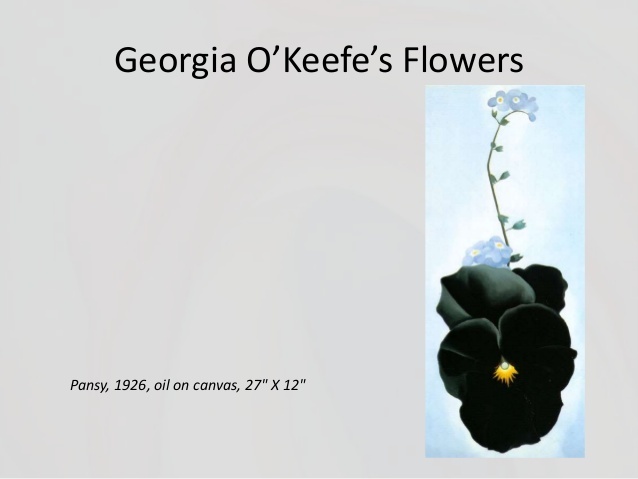 I absolutely love O’Keefe’s take on a black pansy with forget-me-nots, however. And now a poem with, I think you’ll agree, one of the most arresting first lines that I’ve read for a long time. This is ‘Wild Pansy’ by Lisa Bellamy, a poet who lives in Brooklyn and who is a member of the Academy of American Poets. when, heedless, she flew over the meadow. before I passed through her gullet like a ghost. the various, boisterous bloomers, and this was my salvation. yes. Here I am, kissable: your tiny, purple profusion. This entry was posted in London Plants on January 30, 2019 by Bug Woman. Yes, I know pansies as the larger sorts, and violas as the smaller sorts. I do not use any of those other silly names. They are cool season annuals here, since the do not like the arid warmth. That is some poem! Thank you, wonderful post. We too love the delicate little Heartsease. Pansies to us are not the same unless they have a face. We always remember our late father getting into one of his wheezing fits of laughter when he said to our mother ‘ when i’ve gone plant a load of pansies on my grave and all the faces will come up smiling’. 😁 So when we see them we always think of him. Aren’t they a joy on a Winter’s day? I know that those I used to grow didn’t need to be shot out the back end of a Jay to germinate, they shot from the seed pod and grew like Topsy. 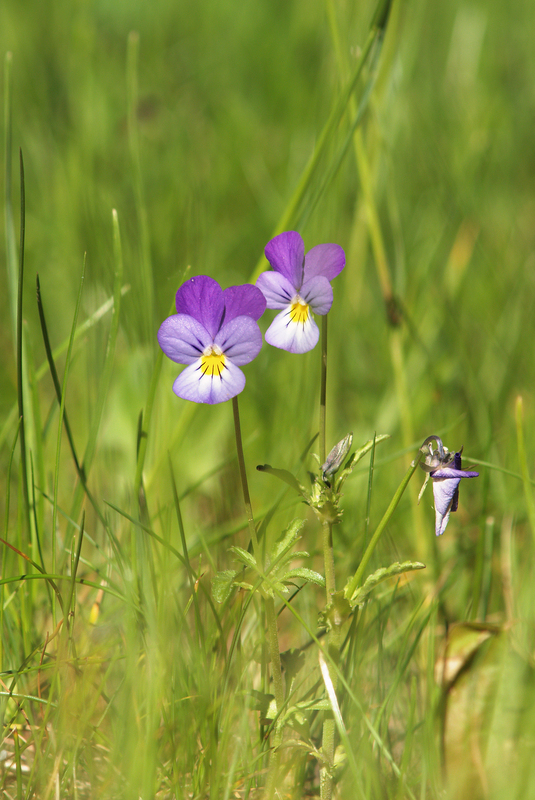 Thank you so much for posting “Wild Pansy.” And now I have discovered your delightful blog. I will be sure to follow on Facebook. Thank you, Lisa, and welcome to the blog! And thank you also for the poem!